Israeli Soldier Killed in Lebanese Sniper Attack. ROSH HANIKRA, Israel — An Israeli soldier was killed on Sunday when a Lebanese sniper opened fire in a normally quiet area of the border between the two countries, and a U.N. peacekeeping force said it was working with both sides to keep the incident from escalating. Israel’s military said in a statement that a from the Lebanese Armed Forces had shot at an Israeli vehicle driving near the Rosh Hanikra border crossing. Israel has lodged a complaint with the U.N. force in southern Lebanon and had heightened its state of preparedness along the border, spokesman Peter Lerner said. “We will not tolerate aggression against the State of Israel, and maintain the right to exercise self defense against perpetrators of attacks against Israel and its civilians,” he said. Lebanese sources said they had lost contact with the Lebanese soldier after the shooting, which took place at the western tip of the border region across which Israel and the Lebanese Hezbollah militia fought a 34-day war in 2006. The U.N. force, UNIFIL, said they had been informed about “a serious incident” at the border. Tenenti said both sides were cooperating with UNIFIL after the incident, which he said appeared to have happened on the Israeli side of the Blue Line dividing Lebanese and Israeli forces. Rockets from Lebanon Hit Israel: Army. Israeli soldiers inspect the site hit by a rocket fired from Lebanon in northern Israel on Aug. 22. Four rockets were fired on Israel Thursday, the army said, adding that two hit civilian areas causing no casualties while Prime Minister Benjamin Netanyahu vowed retaliation. Lebanese security sources said unknown gunmen fired the rockets from the southern port of Tyre into northern Israel while an Al-Qaeda-linked group claimed responsibility for the attack. “A barrage of four rockets was fired at the civilian communities of northern Israel,” the army said in a statement. The army said its Iron Dome missile defence system “successfully intercepted” one of the rockets between the coastal towns of Acre and Nahariya. “Two other rockets landed in populated areas causing damage, but no injuries,” the statement added, while the fourth may have fallen into the sea or elsewhere. A security source in Lebanon said four rockets were fired at Israel from locations “south and east of Tyre,” in southern Lebanon and residents in the area said they heard four blasts. The attack was claimed by the Abdullah Azzam Brigades — an Al-Qaeda-linked group which had claimed similar rocket fire on Israel in 2009 and 2011. It quoted army spokesman Brigadier General Yoav Mordechai saying the rockets were “launched by the global jihad terror organisation” — an apparent reference to Al-Qaeda. An earlier statement from the military had said that none of the rockets had hit the ground inside Israel. An AFP correspondent reported a hole in the ground in Gesher Haziv, a kibbutz east of Nahariya, with debris causing damage to two cars and a number of homes nearby. Israeli army spokesman Lieutenant Colonel Peter Lerner told journalists that airspace in the north of Israel had been closed following what he described as an “unprovoked attack on Israeli citizens”. The Israeli army did not retaliate, Lerner said, and another spokesman said the army considered the attack an “isolated incident”. But Netanyahu warned of future retaliation. “Anyone who harms us, or tries to harm us, should know — we will strike them,” he said in a televised address. Arieh Herzog, a former director of the Israeli defence ministry’s Missile Defence Organisation, warned “this kind of attack could (provoke) very serious action from our side”. He stressed, however, that missile defence capabilities were “much better” than they had been during Israel’s 2006 war against Lebanese Shiite movement Hezbollah. Lebanese President Michel Sleiman meanwhile said the rocket fire was a violation of UN resolutions and of Lebanese sovereignty and urged security forces to hunt the gunmen and bring them to justice. The Lebanese army said the rockets used were of the Katiyusha type, adding that it was investigating the attack along with UNIFIL peacekeepers deployed in southern Lebanon. UNIFIL commander Brigadier General Paolo Serra condemned the attack, and confirmed that an investigation was underway. The Iron Dome batteries, which are deployed throughout Israel, can shoot down rockets with a range of up to 70 kilometres (44 miles). Israeli police urged residents of the north to remain close to bomb shelters after Thursday’s rocket fire. It was the first such incident since November 2011, when the Abdullah Azzam Brigades fired a volley of rockets from southern Lebanon at Israel, provoking a reaction from the Israeli army. Explosion Wounds 4 Israeli Soldiers Near Lebanese Border. JERUSALEM — Four Israeli soldiers were wounded on Wednesday in an explosion along the border with Lebanon, a military spokesman said. The troops were involved in “an activity near the border,” the spokesman said, without providing further details of the circumstances of the blast. They were taken to a hospital. Israeli forces routinely patrol the border with Lebanon, which has been largely quiet since a war with Lebanese Hezbollah guerrillas in 2006. Israeli strike indicates Syria, Hezbollah may have crossed its ‘red line’. Israeli jets reportedly struck an arms convoy carrying anti-aircraft missiles from Syria to the Lebanese militant group Hezbollah, which is building up its arsenal for a possible war with Israel. Israeli jets reportedly carried out an unprecedented airstrike along the Lebanon–Syria border today against an arms convoy carrying advanced anti-aircraft missiles to the Lebanese Shiite militant group Hezbollah. If the alleged arms shipment is confirmed, it would be a significant development that crosses Israel‘s repeated “red line” regarding the transfer of advanced air defense systems to Hezbollah. The convoy was carrying SA-17 “Grizzly” mobile medium-range anti-aircraft missiles, according to the Associated Press, which quoted Israeli and US officials. The location of the attack remained unclear, although reports said it occurred on Syrian territory close to the border with Lebanon. RECOMMENDED: Syria’s chemical weapons: How secure are they? Since 2006, when Hezbollah and Israel fought a month-long war, the Lebanese group has steadily expanded its arsenal, both in size and capabilities, in preparation for a possible conflict with the Jewish state. Lebanese security sources denied all knowledge of an airstrike along the border and there were no reports in Lebanese media this morning of any such incident. Israeli Prime Minister Benjamin Netanyahu last week gathered Israel’s top security chiefs to discuss the threat posed by the war in Syria, in particular the possibility of Syria’s chemical weapons arsenal falling into the hands of radical groups. Syria is believed to have one of the largest chemical weapons stockpiles in the world, including VX and Sarin nerve gas and blister agents which can be loaded into rocket warheads. Over the weekend, Israel deployed two batteries of the Iron Dome anti-missile system near Haifa, close to the border with Lebanon, another indication of Israeli concern at the possibility of Hezbollah acquiring advanced missiles. If Israeli aircraft did intercept a Hezbollah arms convoy last night, there are a limited number of places along the border where the attack could have occurred. Hezbollah controls a lengthy stretch of the rugged barren mountains that mark the eastern border and a small length of the northern border, both of which are believed to have been used in the past to bring in weapons. Hezbollah traditionally remains tight-lipped on how weapons transfers are made, although it does not deny possessing a formidable arsenal. “We do not fight our enemies with swords made of wood,” quipped Hezbollah chief Sheikh Hassan Nasrallah in 2007 when admitting in a speech that “all kinds and quantities” of weapons were being acquired by his party. The Israeli government considers Hezbollah’s acquisition of chemical weapons and advanced anti-aircraft missiles a “red line” that would justify an airstrike. But targeting a Hezbollah arms convoy would be an unprecedented act by Israel and would risk raising tensions along the Lebanon-Israel border, which has remained calm since the month-long war between the two foes in 2006. Last year, Syria confirmed that it had received a number of SA-17 batteries from Russia as part of a deal signed several years ago. Two batteries were reportedly operational last April along the Lebanon-Syria border. The SA-17 has a range of 30 miles and can hit multiple targets at 40,000 feet, putting all manner of Israeli aircraft, from reconnaissance drones to jets, at risk in Lebanese or adjacent airspace. Little is known of Hezbollah’s anti-aircraft capabilities. The only air defense missiles employed by the group in the past were relatively antiquated SA-7 shoulder-fired systems, which pose little threat to Israeli military aircraft. It is believed that Hezbollah possesses the SA-18 grouse, a more advanced version of the SA-7. In 2010, it was reported that Hezbollah militants were being trained in Syria on the SA-8 Gecko mobile short-range system, although none at the time were thought to have been transferred to Lebanon. Israeli Forces Strike Syria-Lebanon Border. “Target was truckload of weapons, going from Syria to Lebanon,” says diplomat, adding that cache likely not chemical weapons. 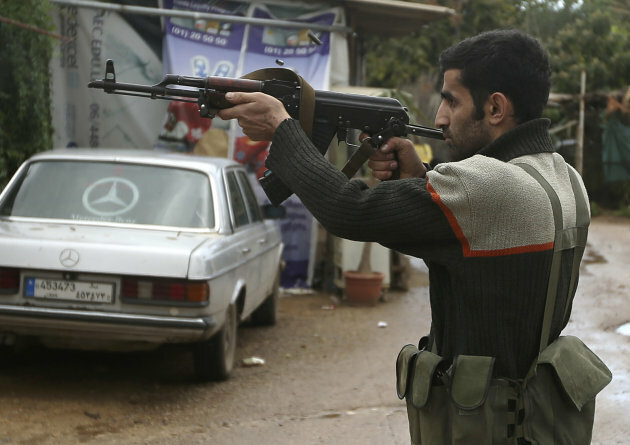 Syrian civil war spills into Lebanon. TRIPOLI, Lebanon (AP) — Gunmen loyal to opposite sides in neighboring Syria‘s civil war battled on Wednesday in the streets of a northern Lebanese city where two days of clashes have killed at least six people and wounded more than 50, officials said. The Lebanese army fanned out in the city of Tripoli in an attempt to calm the fighting, with soldiers patrolling the streets in armored personnel carriers and manning checkpoints. Authorities closed major roads because of sniper fire. The fighting comes at a time of deep uncertainty in Syria, with rebels fighting government troops near Assad‘s seat of power inDamascus. In Brussels, U.S. Secretary of State Hillary Rodham Clinton reiterated concerns that “an increasingly desperate Assad regime might turn to chemical weapons” or lose control of them to militant groups. She also said NATO’s decision on Tuesday to send Patriot missiles to Turkey’s southern border with Syria sends a message that Ankara is backed by its allies. The missiles are intended only for defensive purposes, she said. “At this very moment we know where those missiles are, how they are being stored, whose hands they are in,” he said. U.N. Secretary-General Ban Ki-moon on Wednesday also urged Syria’s regime against using its stockpile of chemical weapons, warning of “huge consequences” if Assad resorts to such weapons of mass destruction. “I again urge in the strongest possible terms that they must not consider using this kind of deadly weapons of mass destruction,” Ban told The Associated Press, speaking on the sidelines of a climate conference in Qatar. Syria has been careful not to confirm that it has chemical weapons, but the regime insists it would never use them against the Syrian people. Ban also suggested that he would not favor an asylum deal for the Syrian leader as a way to end the country’s civil war and cautioned that the United Nations doesn’t allow anyone “impunity.” Assad has vowed to “live and die” in Syria, but as the violence grinds on there is speculation that he might seek asylum. The Syrian crisis has spilled over into Turkey, Israel and Jordan over the past 20 months, but Lebanon is particularly vulnerable to getting sucked into the conflict. The countries share a complex web of political and sectarian ties and rivalries that are easily enflamed. Lebanon, a country plagued by decades of strife, has been on edge since the uprising in Syria began, and deadly clashes between pro- and anti-Assad Lebanese groups have erupted more than a dozen times. Tensions in Tripoli have been mounting since last week, when reports emerged that some 17 Lebanese Sunni fighters were killed inside Syria, apparently after they joined the rebellion against Assad. The bodies of some of the men were later shown on Syrian state TV. On Wednesday, Syrian Ambassador Ali Abdul Karim Ali told Lebanese Foreign Minister Adnan Mansour that Damascus has agreed to repatriate the men’s bodies. Lebanon’s National News Agency said the countries would soon discuss how to hand over the bodies. Anti-Syrian politicians in Lebanon have criticized the government, which is led by the Shiite Hezbollah group, for what they call a lack of effort to get the bodies back. Hezbollah supports Assad, whose regime is dominated by the president’s Alawite sect — an offshoot of Shiite Islam. The fighting in Tripoli pits the Sunni neighborhood of Bab Tabbaneh, which supports Syria’s predominantly Sunni rebels, against the adjacent Alawite neighborhood of Jabal Mohsen, which supports Assad. The sounds of gunfire and explosions echoed near the clashing neighborhoods, and police closed roads leading to the area. Nearby cars raced to dodge sniper fire. Lebanese soldiers parked tanks on a bridge and in a roundabout near the area and patrolled in dozens of armored vehicles, but did not enter the neighborhoods themselves to try to stop the clashes. Lebanese security officials said at least six people have been killed and more than 50 wounded in the Tripoli fighting since Tuesday. The officials spoke on condition of anonymity because they are not authorized to talk to the media. Also Wednesday, a Syrian woman living in the Damascus district of Abu Rumaneh said that the home Jihad Makdissi, a Foreign Ministry spokesman and prominent defender of the regime, went up in flames on Tuesday. “No firefighters came to put the fire out,” she told The Associated Press by telephone, implying the house had been torched by regime supporters. Speculation has been growing about Makdissi’s relationship to the regime. Lebanese security officials have said Makdissi flew Monday from Beirut to London, but it is not clear whether Makdissi defected, quit his post, or was forced out. The government has not commented on the matter. Syria’s uprising began with peaceful protests in March 2011 and later escalated into a civil war that the opposition says has killed more than 40,000 people. Fighting continued around Syria on Wednesday, with rebels clashing with government troops around the capital, Damascus, and elsewhere. Government forces shelled and flew fighter jets over a number of restive areas south, east and north of the capital, clashing with rebels in the eastern suburbs of Zamalka and Arbeen, according to the Britain-based Syrian Observatory for Human Rights. At least two rebel fighters were killed in clashes and three civilians killed in government shelling, said the group, which relies on contacts inside Syria. 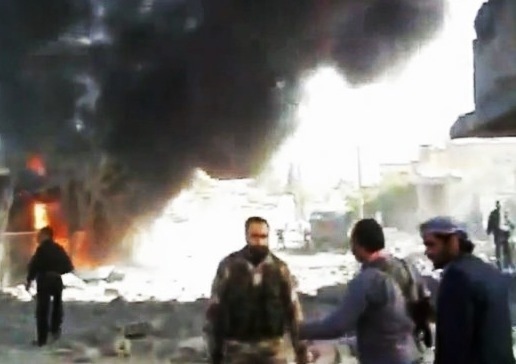 While fighting has intensified in the suburbs, rebels have not yet pushed major fighting into the city itself. A Western diplomat, who monitors Syria from Jordan, said Assad is still in control of much of Damascus. In the north, a Syrian jet bombed the rebel-held town of Tal Abyad, near the Turkish border, while rebels responded with anti-aircraft fire, Turkey’s state-run Anadolu agency said. At least two wounded people were brought to the Turkish border town of Akcakale for treatment. An activist video from the northern province of Idlib showed residents of the village of Talmanis digging through rubble in search of survivors after a government air strike. The video then shows bodies lying in the back of a pickup truck while an off camera voice says five people from the same family were killed in a rocket attack from a nearby army base that rebels have repeatedly attacked. The videos appeared genuine and corresponded to other reports on the incidents. The Syrian government greatly restricts journalistic access to the country, making independent authentication of events nearly impossible. Associated Press writers Karl Ritter in Doha, Qatar, Suzan Fraser in Ankara, Turkey, and Jamal Halaby in Amman, Jordan, contributed to this report.